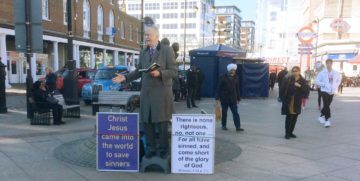 Pastor Peter Simpson was preaching in Uxbridge town centre today, aided by valiant sister Eve Hammond, who busily engaged in handing out tracts. A number of passers-by seemed to carefully read the three Scripture posters on display, for which we are thankful. Some local Christians were much encouraged by the preaching. One young man came up to Pastor Simpson and said, You have no right to stand there and push your religion down my throat. The preacher responded, You are perfectly free to walk by and ignore it, but please may I advise you that it is the most urgent message that you will ever hear. At one point during the preaching a fire engine pulled up nearby with a large message emblazoned on its side : Plan Your Escape Route. Seeing this as a providential opportunity, Pastor Simpson immediately explained that the only escape route from a just and eternal condemnation for sin is repentance and faith in the Lord Jesus Christ. Avail yourself of this escape route whilst there is time, for there is no other. A good numbers of tracts were distributed, and we thank God that the bright weather and many people being around afforded us an opportunity to tell forth the unsearchable riches of Christ. 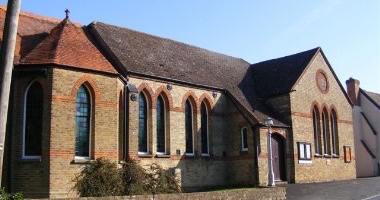 May many who heard in Uxbridge today be drawn to serious consideration about what the preaching continually reminded them of, namely that they have no goodness of their own, and that their current standing before God – without Christ – is one of abject guilt and condemnation.